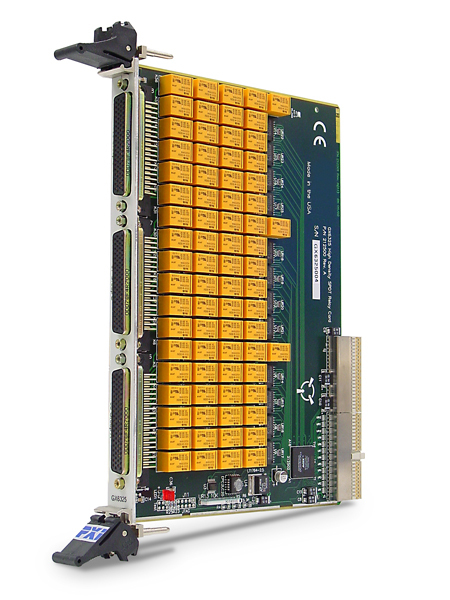 PXI Switching, General Purpose Card - GX6325 | Marvin Test Solutions, Inc. The GX6325 is 6U switching card with 75 SPDT Form C relays with a switching power rating of 60 W. Featuring the highest density available in PXI for this type of switch card, the GX6325 is suitable for all test applications requiring general purpose, low level switching. The GX6325 consists of three groups: A, B, and C. Each group has 25 high current relays and a 78-pin D type connector. Each of the relays can be latched or unlatched under program control. Connections 78-pin D Sub-type connectors. Includes three mating connectors.